- Size: About 12 * 12 cm(L*W). 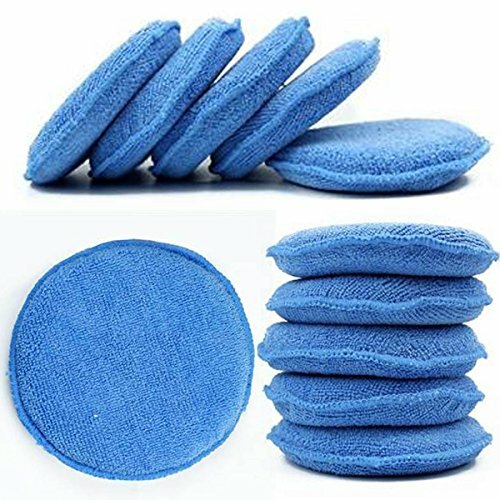 - Two sides of this sponge can be used easily. - Can be used for car waxing, cleaning, dashboard body clean, maintain leather seats, air-conditioning outlet clean. - Apply to car interior instrument desk, leather seats, bumpers, car skirt goods such as glazing protection. - High density, leaving no crumbs, durable. - When waxing, sponge easy to absorpt solution, makes it easier to wax the car paint. Size: About 12 * 12 cm(L*W). Durable, one sponge can wash and wax your vehicle up to 8 times. Both sides of the sponge can be used.Ideal for car cleaning/ detailing/ valeting.